Yesterday was a teachers’ planning day in Portland, so all public school students had the day off. I called my mom up and proposed an afternoon of hijinks and camaraderie. We first indulged in some comfort food and pie at the Village Inn and then hit up the nearby Goodwill thrift shop. She’s been cramming for her master’s degree orals and I knew she needed a break. 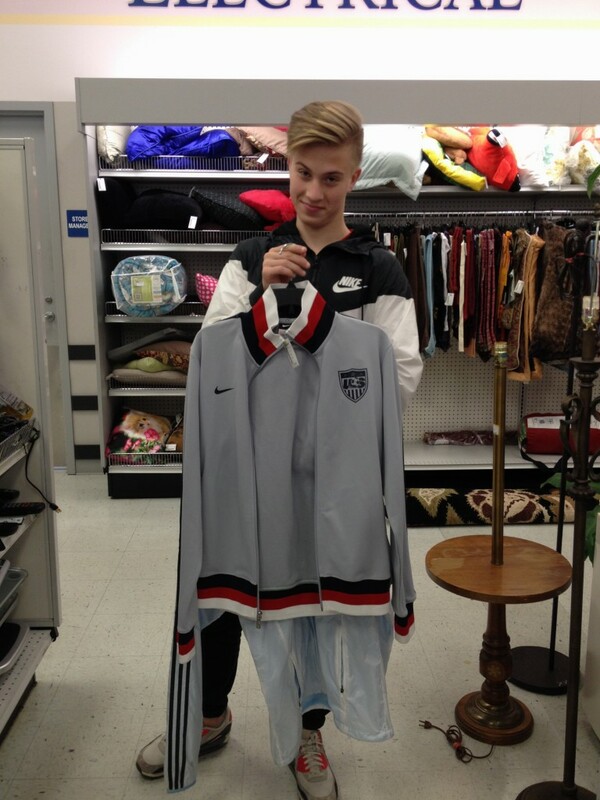 My mother was looking for a blouse, I was looking for weird stuff to photograph and my son, as always was looking for soccer related bargains. 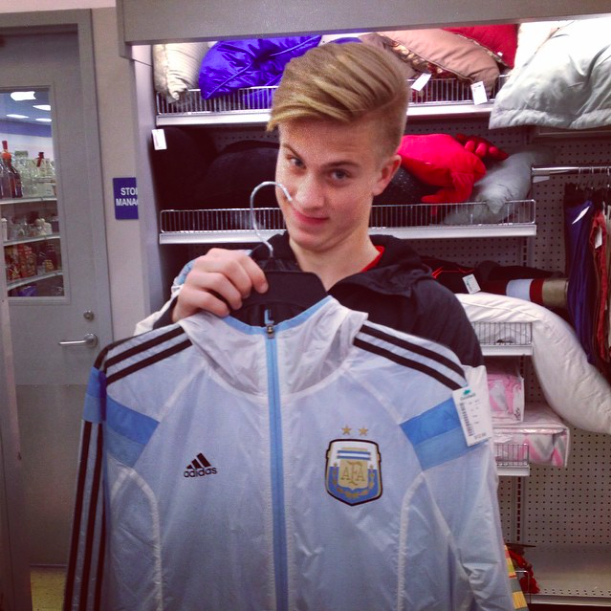 He quickly located this Argentina national soccer team jacket, priced at $13. And since they normally sell for $90, a certain 16-year-old was happy to let his grandmother buy him a treat. He was also drawn to this American national soccer team jacket. 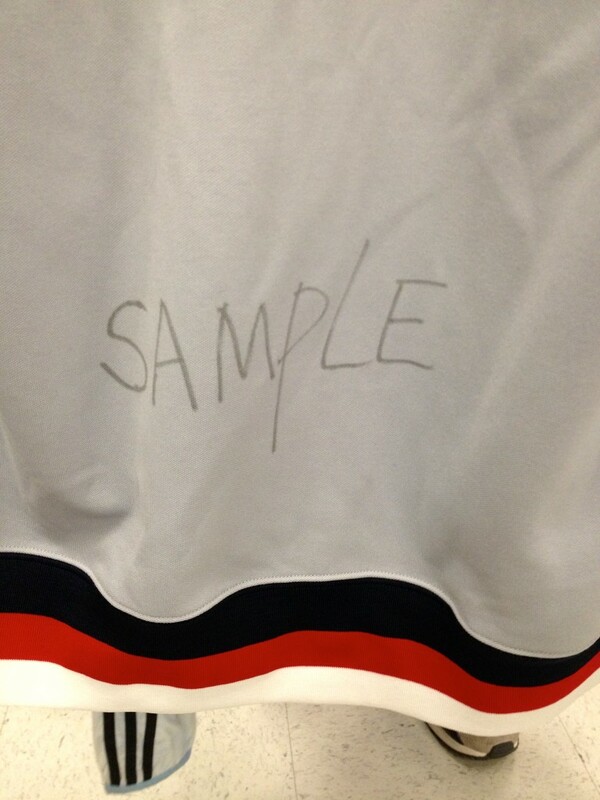 But was less excited about the word “sample” written across the back. Had the jacket been priced appropriately, we would have been happy to bring it home and use a solvent to remove the ink. But since the two jackets were priced the same, there was no contest on which one to buy. 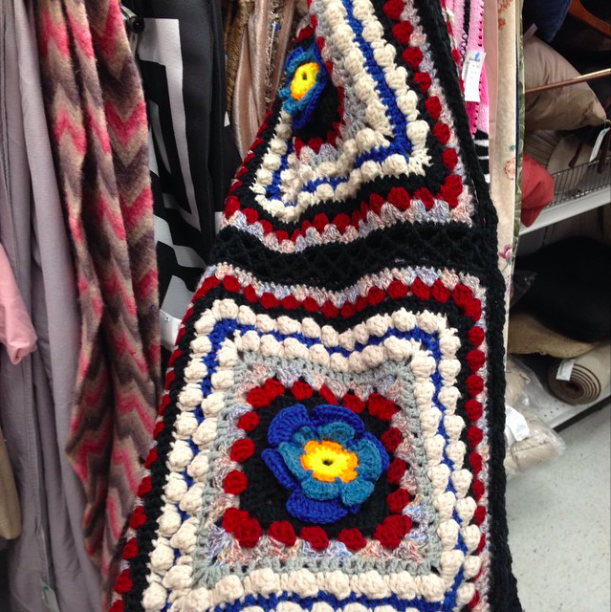 I had a brief but intense love affair with this hand crocheted afghan. Such great colors and lovely flower detail! But $19.99 was too high a price for me to bust out one of my Goodwill gift cards. (Yes, it costs more than $20 to buy the yarn for such a large project, but what can I say? I like a bargain!) Plus, you know . . . I need another lap blanket like I need a hole in the head. 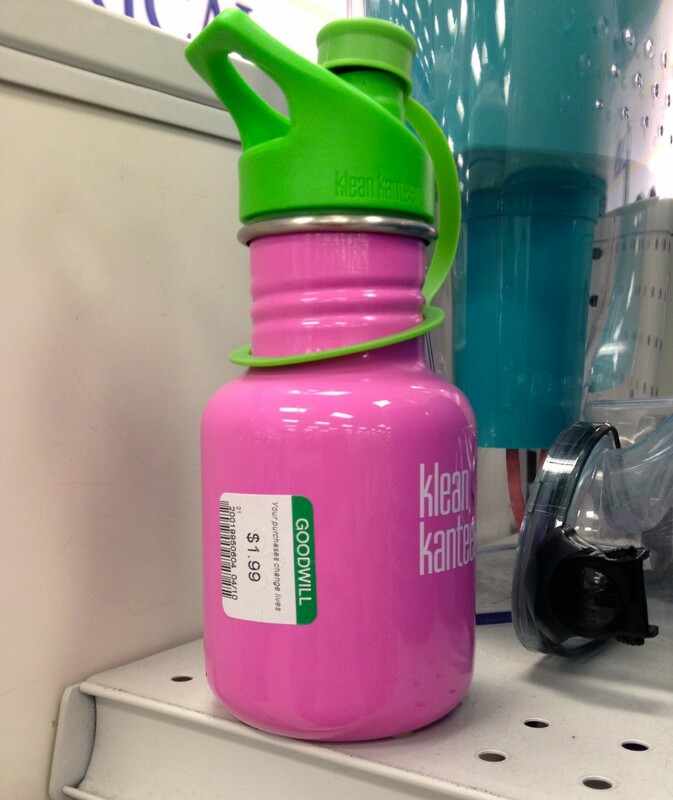 I did appreciate the $1.99 price tag on this Kleen Kanteen beverage container. I know Kristen from The Frugal Girl would have popped this lil’ guy into her cart, but we currently have the perfect number of water bottles. Plus, it’s for little kids. 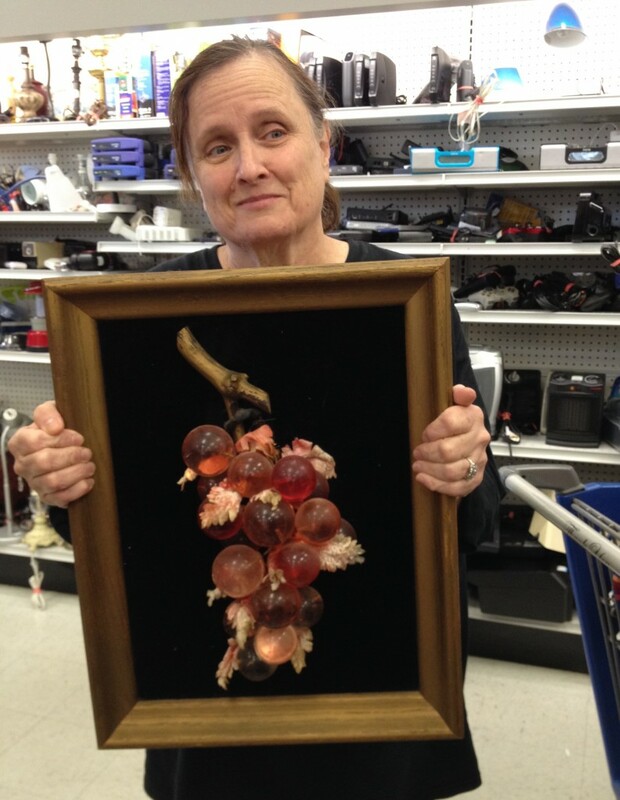 I had a deep appreciation for this framed glass-grapes-on-black-velvet artwork, especially since it was one of a pair. So perfectly kitchy! It weighed approximately 754 pounds, which I think deserves some respect. Sometimes I wish I was a set decorator for the movies, and then I could spend my days scooping up weird vintage items. 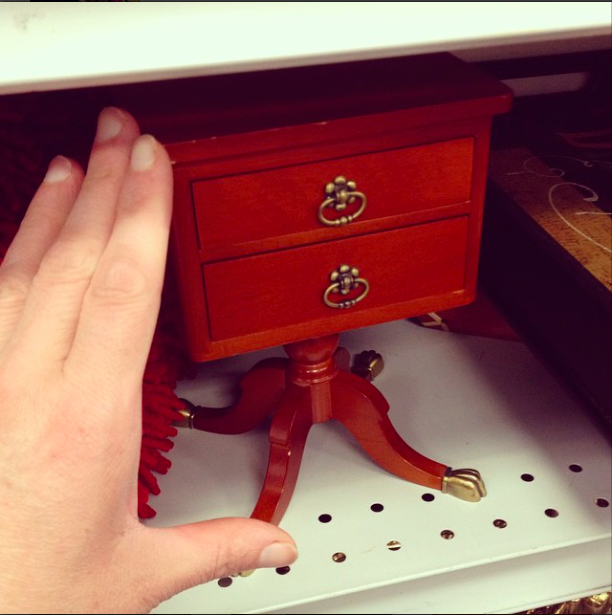 The one thing I did snap up was this $4.99 miniature end table. With quality that rivals most Ikea items, I had a strong suspicion it was an official American Girl Doll accessory. And my instincts rarely fail me, as this turns out to be Kit Kittredge’s table, and here’s one that recently sold on eBay for over $42. But I didn’t buy it with an eye for resale. Nope. I bought it for my ten-year-old niece Emma. Emma’s mother and I were mad for our Sasha dolls when we were kids, and are still unabashedly obsessed with anything that’s the right size for our dolls. (So yeah . . . The American Girl Doll store was as much for me as it was for Emma.) Which is how my sister sent me these tiny Tabasco sauce bottles for my birthday this year. 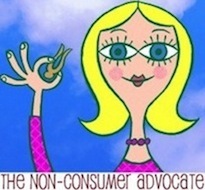 Of course, no Goodwill, Badwill, Questionable-will post would be complete without a what the fü¢& were they thinking item. This umm . . . back massager. With the rather virile and masculine handle. NOT OKAY TO BUY USED! NO! A totally legitimate exception to the buy-nothing-new Compact. Okay to landfill this bad boy. 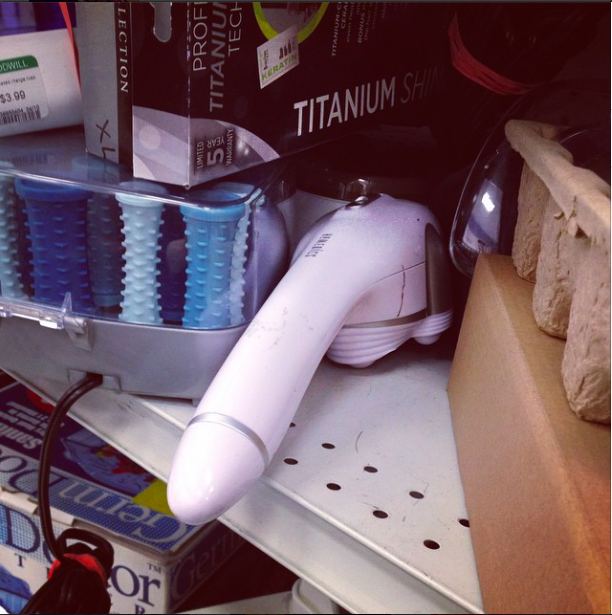 Do you go into thrift shops and marvel at the oddity of merchandise and pricing until you find that one perfect item? Please share your thoughts in the comments section below. I am 66 so obviously well beyond doll buying years, but oh I long for several of those American Girl dolls, especially the one from World War II. I have three granddaughters that are 6, 4 and 1 1/2 and I may grace them with one some day, but I don’t really know what age the girls should be before they “get” that these represent another time period. P.S. Okay, it would partly be for me because I would have to “help” them play with her. They have baby dolls. And can easily be found used as well. Actually, I meant to ask how old your niece was when she got her American Doll. 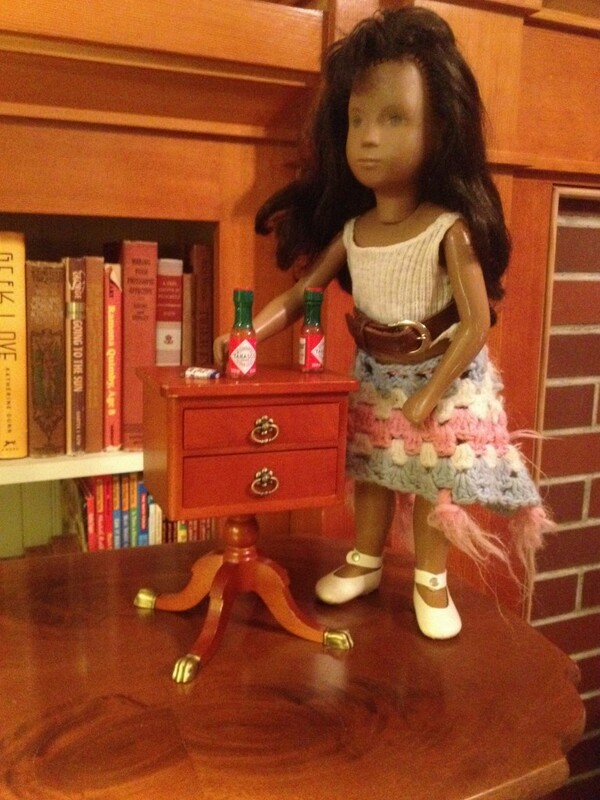 My oldest (15) got her first American Girl doll–Kit!–when she was 6. I thought that was too young, but she absolutely cherished Kit and still has her displayed. My youngest (10) got hers about the same age. I got mine when I was about 10, which was perfect because all the dolls have the book about turning 10. I think 8 or 9 would have been okay ages too. 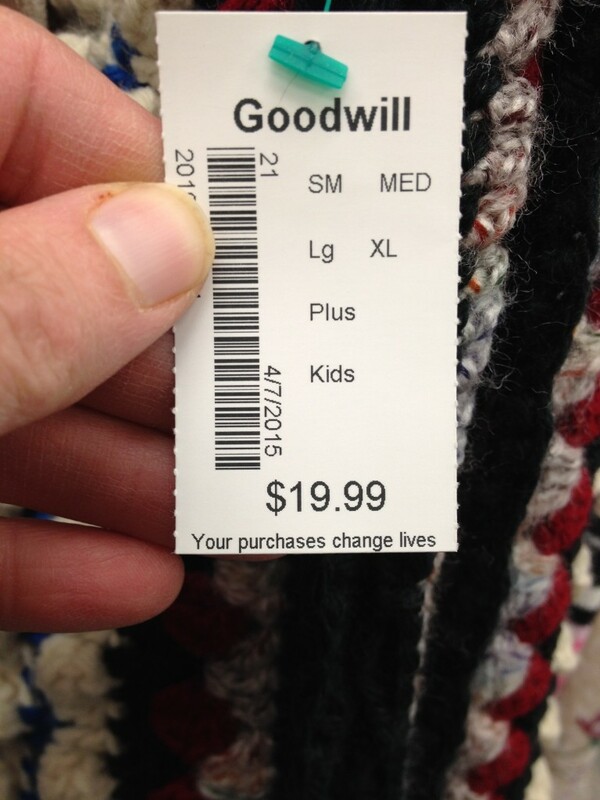 I’m marvelling that your Goodwill puts real price tags on its items! They are handwritten at mine and just have the price. I frequent a few thrift stores for colored glass plates that I can display with light coming through them. Always on the lookout for dolly size goodies, too. I used to sew clothes for American Girl dolls which I sold at craft fairs. Still love to find the right sized treats! Vintage sewing machines have become a new passion for me. I rescued one that weighs a ton and would make a door stop! It will be an art project because it is so rough. Didn’t have any real plans for the machines, but just today found out about an organization that may be interested in basic sewing lessons for their clients. These machines would make the lessons really useful. Time will tell! Last visit I found a nearly new book about keeping deer out of t h e garden. Plan to read and memorize that info for our new place. I’ve read that some organizations use the old non electrical ones to send overseas where they don’t have electric so people can make money by sewing items to sell and making quicker work of it than by hand. Tell yo’ mama that if she could stand there holding a bunch of framed glass grapes weighing 754 pounds, she’s in much better shape than I am! I think the Argentine national soccer team jacket is great — a real find. I love shopping at Goodwill. Years ago I found a set of Dansk cereal bowls and coffee mugs at Goodwill (6 of each). Very inexpensive, very sleek and modern-looking in blue and white. We have used them every morning for the past 20 years and I still love them. Yes, there’s not a single day that doesn’t see me using my thrifted finds! Love the American Girl chest! The AG dolls are really popular at our school, and I’ve made sure the library has as many of the books as we’ve been able to buy. I currently make jewelry for them – sets that can be worn as either doll mama (doll bracelet = mama ring; doll necklace = mama bracelet). I went to Chicago a few years ago with a friend and her daughter and a friend and we spent the day at the AG flagship store. Wow. I’ll just say, it cost more to have the doll’s hair styled there than it cost me to have mine done at the salon at home…. but it sure was fun browsing. Oh my lord did I love getting the American Girl catalog in the mail when I was a kid. I did want the stuff, but not badly enough to lobby hard for it … and now looking back honestly I probably had just as much fun gazing at the photos as I would have had playing with the toys. … and I definitely hit up the AG store in Chicago a few years back as well. As an adult, without a kid. Why not? Since I just moved and there is a Goodwill right down the street, I dragged my sister when she was here for a visit. She did not enjoy it. Me, on the other hand, was so excited because I found a coffee butler for $1.99 that matched the one my father gave me. My father used to only give perfume and make up for gifts, but that was one gift I truly enjoyed and used when we had company. But my husband broke the thermos on the inside. I was so excited to find the exact same one! This one mostly has clothes and I’m not interested in getting more clothes. So I will keep checking it out to see if there is anything else I need for my new home. I consider a trip to the thrift store as entertainment, sure I make a purchase now and again but even if I don’t I have fun. They are a strange combination of museum, and Ye Old Curiosity Shoppe. I often find the prices very amusing, like merchandise with Dollar Store Labels priced at $2.99. What are they thinking? Do they think? Watch the shipping, though. I usually only bid on things that are located in my city, so I can pick them up and not pay shipping. Once in a while I’ll make an exception, if it’s something I’ve been watching for and the price is right. I would never sell my Sashas! However, I did once find a pile of them at Goodwill, and I sold them on eBay and made a couple thousand dollars in profit. Except for one which I gave to my niece. When my girls were still young enough to be obsessed with American Girl dolls (sigh), my brilliant mother came up with an amazing game to play with them at the store. Most big ticket items have tiny little post-it sized pictures and explanations next to their display. My mom and the girls went around the store and took two each of the descriptive cards they liked best. Then when they got home, they played “American Girl Bingo” with them. (I should add that my mother did also buy them each a little outfit for their doll – so she did not feel guilty taking a bunch of free promotional materials – though I’m not sure I would feel bad in any case). I rarely thrift anymore, but once in awhile I feel the call of the hunt. Last week I went to Family Thrift and found 2 lovely cotton summer tops price just right at under $4.00 each….both brand names, well fitting and well constructed. I never go with any particular item in mind and am always delighted to find something that suits me perfectly! I thrift-shop once in a while but I have to be in the right mood – if I’m down at all, it depresses me even more. When I’m feeling strong, I look for books and household items, and only rarely, clothes. My second job requires green cardigans (crazy specific, no?) so I check for those. Once I found a beautiful cardigan that I still get many compliments on. BTW, I love the idea of “treat the store like a museum, and just look at the stuff and appreciate everything.” That’s what I do when I’m with my sister who loves little boutique shops. My son moved to Santiago, Chile to teach English at a community college. He lives near a terrific open air flea market. Are there any Chilean soccer items your son would like him to look out for? Do you have a line on any cheap Timbers items (coasters, stickers) that he could give as rewards to his students. I looked on their website, but didn’t see anything like that. My son has never been into fútbol but out of necessity, he’s learning! I can ask my husband. Right now I’m on a de-cluttering kick, but normally I try to visit the local Goodwill at least once a month, sometimes more. I head there after my trip to the gym on Tuesdays. My all time favorite buys: an LL Bean corduroy shirt dress (a number of years ago) with tags still on it. Paid $5, wore it for close to 10 years! A red painted curio cabinet with glass panes in the doors–for which I paid $15–I’m pretty sure it’s authentic arts and crafts style—I refinished it and found it was walnut underneath. Have had that for 35 years or more, and we still call it “the red cabinet.” Our local Goodwill had just moved into a new storefront when my granddaughter got her first job—I went to their opening and found her two pair of Gap khaki pants—she had to wear khaki’s and Gap was the best fit for her at the time–$4 each pair. I’ve picked up shirts for my daughter’s step-daughter a few times because they were such good quality shirts I couldn’t stand to leave them in the store, and they were her size. If her mother wasn’t so unpleasant, she would get even MORE from my travels. I even hit thrift stores on vacation–found one of my favorite Tupperware pieces in a place in Custer, South Dakota. A dollar well spent. I’m thinking about shopping for a new bread machine–I’ve gone through all my relatives unused ones, and the one I’m currently using has one paddle that is hard to turn. I’ve gone through two new ones also. Been making all our bread, rolls and pizza dough for a lot of years now–between 15 and 20, I’d say. Saves a ton of money and it’s good bread, too. I enjoy thrift shopping WAY MORE than new stuff shopping, except maybe for treasures at TJ Maxx. I have to say, I really like the kitchy grapes-on-black-velvet art! That’s really cool!